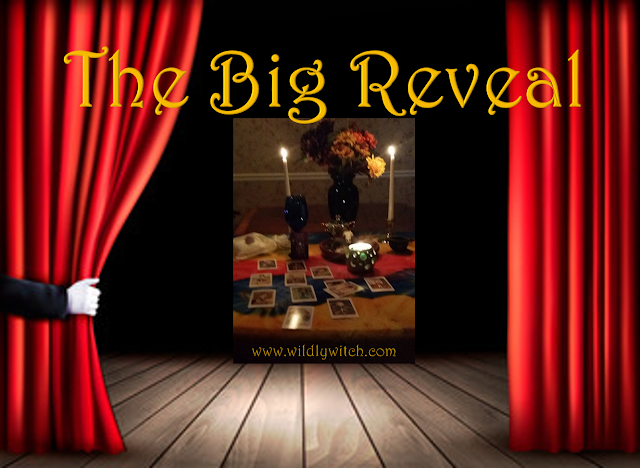 It's time for the Tarot Tuesday Big Reveal here at Wildly, Witch. If you haven't done so already, please go to the Facebook Page and select your card. For those who have, let's get to it! 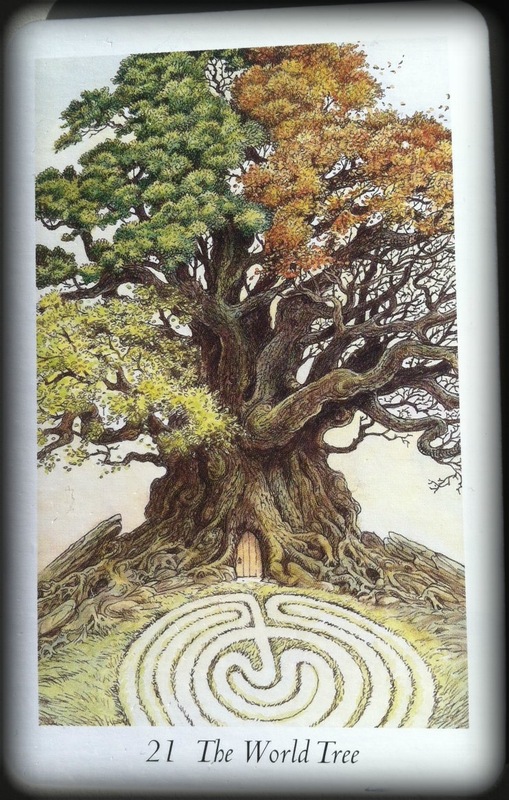 This week's featured deck is The Wildwood Tarot by Mark Ryan, John Matthews, and Will Worthington. You can purchase the deck here. Key words: Hastiness, speed, progress, movement, action, rushing, exciting times, travel, freedom, holiday, holiday romances, taking off, gaining momentum, ahead, thinking on your feet, sudden action, hard work paying off, results, solutions, energetic, positive, infatuation, obsession, being swept off your feet, jumping in. The Ten of Pentacles represents solid foundations, security and happiness in all areas of your life. 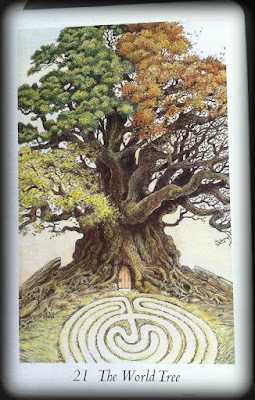 Like all Pentacle cards it is usually connected to financial or material issues so you can expect especially good things in those areas of your life when it appears. 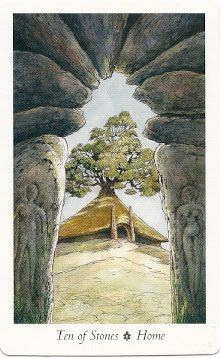 It is also a good card to get in relation to family as it represents family responsibilities, family values and support. You could find yourself tracing your ancestry or discovering your family tree when it appears. You may be feeling very close to your family at this time, as the Ten of Pentacles can signify domestic harmony. Or you may be looking forward to a family event, celebration or gathering. 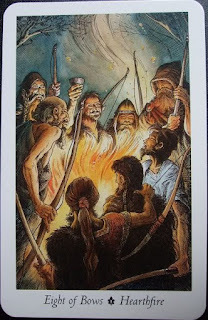 This Minor Arcana card can represent being conventional and embracing old school traditions. Life should be stable and settled when it appears in your Tarot reading. When this card appears in the present, it describes either your finances or your current values. Abundance in money at the present may be leaving you wondering just who your friends are. Your values may be becoming quite conservative. Are you settling down or hiding out? Are you becoming stingier as you acquire more and more money? Are you so bored by an easy life that you are not challenging yourself to be all that you can be? As inoffensive as the Ten of Pentacles is, its appearance in the present position in a Tarot card reading might be more of an indicator of you being a couch potato instead of developing yourself into a more dynamic, happy person. The Tarot will remind you that playing it safe is often detrimental to your overall well-being. Key words: Unexpected financial windfall, lump sum, will, deeds, trust funds, inheritance, solid foundations, privilege, inherited issues, ancestry, family home/ business/ responsibilities/ values/ support/ issues/ riches, old money, affluence, business empire, domestic bliss, contracts, pensions, long term financial security/ stability, being conventional/traditional, settling down, prenuptial agreements, marriage, marrying into money. 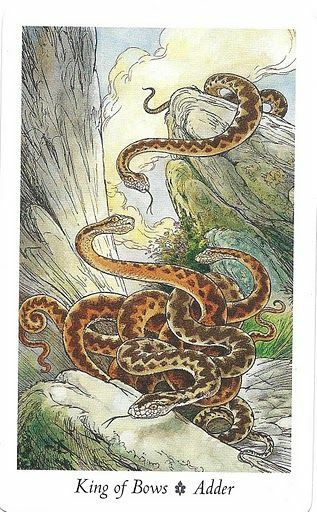 In the present position, this card is a powerful affirmation of a climax upon which you are treading. To dream is a natural state in all humans, but to live your dreams and see them manifest is actually not an ordinary state in which to exist. No matter how much you are getting what you have always wanted, there could be lots of anxiety in your life because this situation is so abnormal. To always want and then to get what you want puts you in unfamiliar territory. The reassuring nature of this card in this position should underscore that you should be careful not to sabotage your recent gains out of anxiety. Stress occurs when the happiness caused by this state of contributing to the world with the best talents you have suddenly seems so new to you. The World can also mean you will have the world at your feet in another sense, i.e. that you will be successful and the opportunities available to you at the moment are endless. You have gone through the trials and tribulations of the rest of the Major Arcana, you have endured the hardships and learned your lessons and now you will reap the rewards. You should be proud of what you have achieved, it has not been easy to get here but you’ve done it. The universe is smiling upon you and luck is on your side when this Major Arcana card appears in your reading so grab the opportunities available to you. The World can represent the completion of a challenge such as a university course or a project or can represent finally achieving a dream or aspiration such as starting your own business, getting married or having children. You have reached the point where you can be happy with what you have accomplished. Success can bring a whole new set of challenges or worries so make sure you’re not carrying the weight of the world on your shoulders. You’ve worked hard to get to this point so stop and savor the moment! Celebrate your accomplishments. Key words: Success, achievement, accomplishment, travel, completion, fulfillment, sense of belonging, wholeness. The King of Wands indicates that you will have the energy, experience and enthusiasm to accomplish what you set out to achieve at this time. You are taking control of your life. You will motivate those around you, lead the way forward and set a good example for those who look up to you. You do not worry about other people’s opinion of you and you dare to be different when this Minor Arcana card appears in your Tarot reading. As a person, the King of Wands is a mature male who is confident, strong, energetic and optimistic and a natural born leader. He may be a fire sign such as Aries, Leo or Sagittarius He is friendly by nature, funny, charming and good with words. He is also fearless, freethinking, motivated and action-orientated. He has an independent streak and as such, he needs his freedom and will not tolerate neediness. The King of Wands does not like to let emotions stand in the way of his enjoyment of life. He is usually supportive of those around him and has learned to be lenient. However, the King of Wands can be self-centered, hot-tempered and controlling. However, at his best, when he is allowed his freedom, he is proud, passionate, honest, loyal, dependable and protective. How did you do? Come share your thoughts on the Facebook page, and support someone else who has shared!